Having a full week to teach is really an extraordinary thing, since I’m used to doing half-day or single-day workshops. 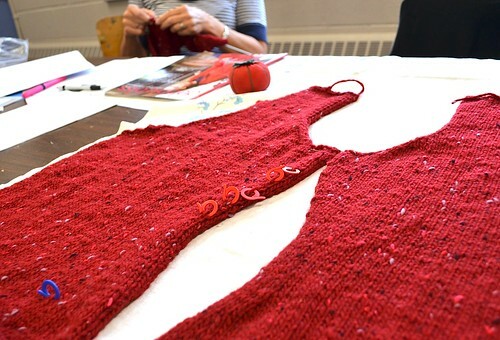 In this class we spend time alternating knitting on sweater projects to talking all about the many details that go into sweater knitting like swatching, fit, measuring, finishing steps, considering your yarn and substitution possiblities, even making duct tape dress forms, and on and on. 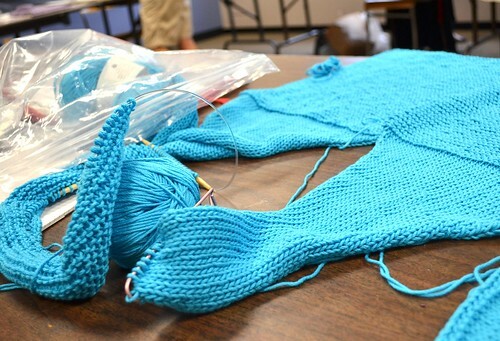 And because it’s knitting, everyone gets to chat while working away, and this week my students finished their time with hugs and a hope to see people again next year – it really is sort of like summer camp for grownups. 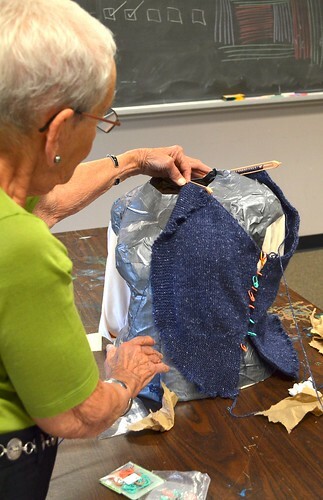 It is also an intriguing thing to be doing a class like this down the hall from such a diversity of other workshops – pastel drawing, painting, fiddling, jewelry-making, clowning, and so on. 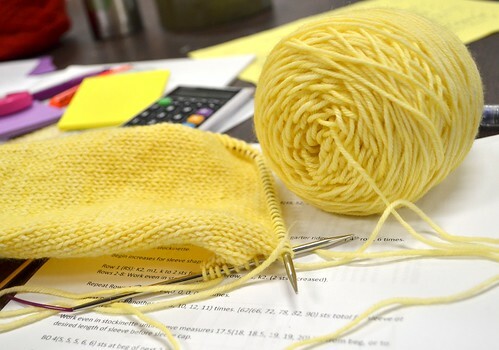 Chatting with the other instructors inevitably brings up interesting comparisons between our work and it is fascinating to try to place knitting amongst or in parallel to so many other creative pursuits. I think there is a lot of common ground in that everyone is trying to make something, create something, in a way that pleases them and meets some personal need in their lives or expresses something about themselves. I have no doubt there is artistic truth in knitting, but most days of my knitting life pass without me thinking directly about it. In the mean time though, I’ve now gotten myself back to the real world, remembering how constant connection to the internet and reality is both wonderful and horrible all at once, and diving right back into the final stretch of my deadline projects before figuring out the next batch of things for August and the fall. And maybe catch up on a bit of sleep in there somewhere too, heh. It’s that re-entry, as they say. My teaching page (up there on one of my blog tabs at the top) is on its way to filling up for the fall! Lots of day workshops scheduled for Toronto, and I’ll soon be adding a few more for Peterborough and who knows where else along the way. Busy bee!! I love comparing notes with other crafty people and it always inspires me the amount of fabulousness out there. Re-entry is always hard.. good luck! 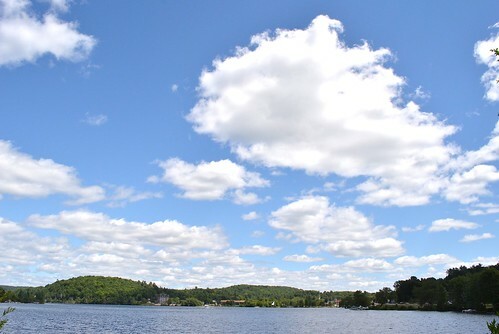 What a beautiful view! And the colors your students are using make me happy! Recuperate well – full steam ahead. You inspire me. A week of knitting, learning, chatting and making new friends sounds just glorious. I am there in my dreams. Would you ever consider teaching the same class on line? Those of us who cannot attend your class due to distance I am sure would be willing to attend on line. I think a lot about the issues you raise about the intersection of knitting with “arts.” There is a gallery in my home town which touts itself as a purveyor of “contemporary craft.” By that they mean…craftsmen trying to legitimize themselves by calling themselves artists. One of the reasons I like the knitting world is that for the most part, knitters are immune to that. They don’t feel the need to legitimize themselves or how they spend their time. It is enough to knit a pair of socks. I’ll be sorry to see the “fiber artist” trend take hold in the knitting world. I know I am a lot in the minority on this one. Oooh I wish I lived closer to Toronto (and not billions of miles away) so I could take one of your classes. Sigh. I have a few questions on creating ones own pattern. basically, how do you start your own pattern? what are the steps involved? and how do you go about creating a 3D object on paper? Is there any way you could do a post about the basics of creating your own pattern with tips and tricks from your own adventures? I would love to attend one of your classes but dont live in the GTA. If you previously posted something similar to this could you tell me the date? I too was one of the lucky ones who was able to attend the knitting class in Haliburton. I must say that I learned a lot but more importantly to me I feel more confident in my ability to knit (like I’ve moved up a level). I can’t wait to finish the sweater I started. I’m intrigued with the idea of an on-line course. I’ve attended many courses on-line (all courses work/profession related & a few technology related) but I’ve never considered a fun knitting class. It would be great over the winter when it’s nice to be able to “attend” regardless of the weather outside. I would definitely join that class Glenna. Thanks for another great class Glenna. I really enjoyed it! And my new little beautiful dog is doing great!